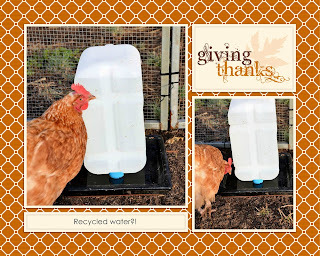 Hamby Home(in)stead ...: Like water for ... chooks! I mentioned earlier that the bore water isn't particularly palatable to drink unflavoured, so we've been using bottled water for our beverages - and when taste matters! The other day it occurred to me that the empty water container might be adapted for as a chook waterer/feeder. I wasn't sure how to effect my plan, so suggested the idea to Nick. When we were poking about the dump shop he found a heavy planter base, which was purchased as part of our $10.00 bargain haul. Once home the upended water container was stood upon the planter base. A slight modification was necessary but at this stage the automatic chook waterer seems to be working well. The chookies are appreciative - and we are enjoying not mucking out/topping up their water throughout the day!